Binkley joined a Stanford ambulance company, which became SSU 578 of the US Army Ambulance Service, and was sent to Allentown, Pennsylvania for training. The unit passed through England and received further training in France. Binkley received the Silver Star for gallantry in action, making several ambulance runs under heavy bombardment at Fléville, France, during the Argonne Offensive. Under the direction of E.D. Adams, Binkley helped gather materials from Peace Conference delegations and war-time societies and government agencies for the embryonic Hoover War Library. Sails from Liverpool and reaches the new Binkley Ranch at Cobb, California, on Christmas Eve, after 2½ years away. 📖 Feb.-May ~ "Trend in Europe"
Bob and Frances collaborated on columns on international affairs for the San Francisco Journal. 📖 Early 1926 ~ "Barnwoggler's Invention"
An unpublished and now lost story by Binkley about a research machine. Current History 23.4 (1926): 531–533. Binkley’s first publication to gain public attention. Publicity shot of Binkley in the Hoover War Library. (with A. C. Mahr). Current History 24.3 (1926): 398-400. Bob and Frances drove across the country in their Model T, visiting Frances’ family in Oregon on the way, to take up a teaching position at NYU Washington Square. Binkley wrote a memo on the subject which he and Henry Lydenberg at NYPL submitted to the Laura Spellman Rockefeller Foundation. NYU considered acquiring Broadman’s collection of World War newspaper clippings and other ephemera. Scientific American Jan. 1929: 28–30. At the request of George A. Hulett, Binkley prepared a memorandum on the potential of photography for the reproduction of texts, as an aspect of the solution to the perishable paper problem. Aug. 25 ~ Birth of Robert "Binks"
Binkley was hired to fill Sidney Fay’s position after Fay moved to Harvard. The Journal of Modern History 1.4 (1929): 607–629. This article established Binkley’s reputation as a historian of the Peace Conference. Binkley is head-hunted by Western Reserve University. 📖 Feb. 5 ~ Article: "Free Speech in Fascist Italy." New Republic 61.792 (1930): 291. Binkley accepted the position as chair of the History Dept. at Women’s College (which changed its name to Flora Stone Mather College the following year). Binkley teaching at Stanford, living in Sidney Robertson’s house in Palo Alto. 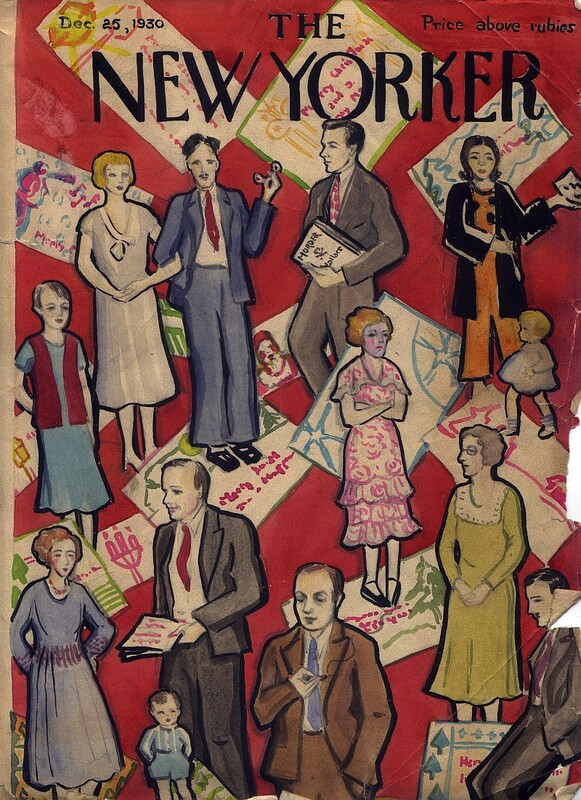 The Binkleys spent Christmas in New York with the Morton St. gang, who prepared this New Yorker issue. Binkley gave a series of lectures on Europe from 1815 to the present for Cleveland College. Methods of Reproducing Research Materials: A Survey Made for the Joint Committee on Materials for Research of the Social Science Research Council and the American Council of Learned Societies. Ann Arbor, Mich.: Edwards Brothers, 1931. Binkley taught summer school at Harvard and stayed through the academic year, replacing William Langer. An experimental microphotography project for the Paris Peace Conference History and Documents series of the Carnegie Endowment, supported by the Joint Committee, with the work done by Bob and Frances and Frances’ father William I. Williams. Dec. 29 ~ "Methods of Reproducing Research Materials"
Binkley gave a paper at Conference of Historical Societies at Toronto, at the joint AHA/CHA conference, on alternative publishing methods and the means to do short-run publications. Aug. 25 ~ Purchase 17918 Windward Rd. On returning to Cleveland from Cambridge, the Binkleys bought a house. (May have started in 1933). Worked on Joint Committee office management and research. The first large-scale microfilm publication project. The records of the hearings of the National Recovery Administration and the Agricultural Adjustment Administration (totalling 286,000 pages) were copied on 16mm film using Recordak equipment and distributed to subscribing libraries for about $420. 📖 Nov. ~ "New Tools, New Recruits for the Republic of Letters"
Adeline Barry was hired for Joint Committee work, and did research and editing for the Manual. 📖 Mar. ~ "New Tools for Men of Letters"
Yale Review n.s. 24 (1935): 519–537. Article cut down from the memo of the previous November. A landmark agreement between the Joint Committee and the National Association of Book Publishers clarifying the the scope of “fair use” in copying of copyrighted materials by libraries for scholars. Under the direction of Binkley’s student Lillian Kessler Fuchs. McCarter resigned because of illness and also clashes with Adeline Barry. At the AHA conference in Chattanooga there was a session to discuss the theory of federative polity developed by Binkley in Realism and Nationalism, which had just been published. A WPA project to index Cleveland’s historical newspapers. Frances spent six months developing the newspaper digest system. Manual on Methods of Reproducing Research Materials: A Survey Made for the Joint Committee on Materials for Research of the Social Science Research Council and the American Council of Learned Societies. Ann Arbor, Mich.: Edwards Brothers, 1936. Binks was prone to ear infections, and their doctor warned that he might need a mastoid operation if he spent another winter in Cleveland. 📖 Jan. 18 ~ "History for a Democracy"
Binkley replaced Carlton Hayes. The boys spent the fall term with Bob and Frances in New York, then at Christmas were taken to Florida to stay with Frances’ parents. Death of Binkley’s father in California. Binkley and his brother Charles flew from New York to San Francisco. A day-in-the-life description of Binkley’s current work and concerns. Frances studied with Rabinovitch in New York. Frances had her first commercial portrait sitting in Cleveland. Frances took a one-year program to get her degree in Library Science at WRU. The university waived tuition in Binkley’s memory. Frances was appointed Social Sciences Librarian at the University of Colorado, and held this position for the rest of her life. Selected Papers of Robert C. Binkley. Ed. Max H. Fisch. Cambridge, Mass. : Harvard University Press, 1948. Frances' portrait of Bob used as frontispiece.